The Banana Split Bites Recipe is brought to you by Just Plum Crazy. I love bite size holiday foods. 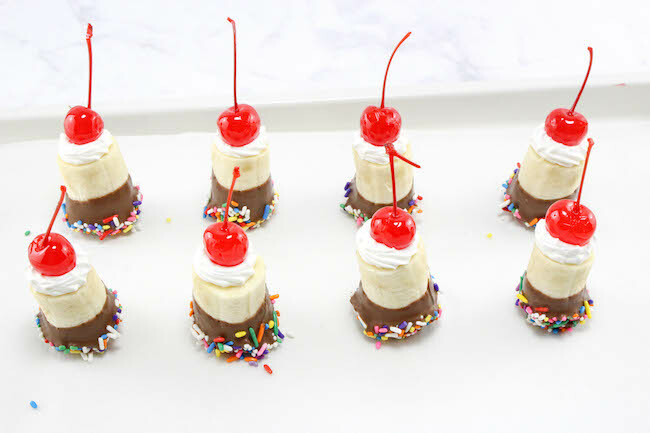 The Banana Split Bites Recipe is perfect for a last minute treat for the 4th of July or any holiday for that matter. Make them red, white, and blue or change them up for different holidays. Green for St. Patrick’s Day, red and green for Christmas, orange, green, purple for Halloween, pink and red for Valentine’s Day….you get the picture. These are one of those “you can make for them for whatever you want” kind of bite size tidbits. The best part about these is you can even make them and freeze them ahead of time so they will cool everyone off especially if it’s hot. 1. 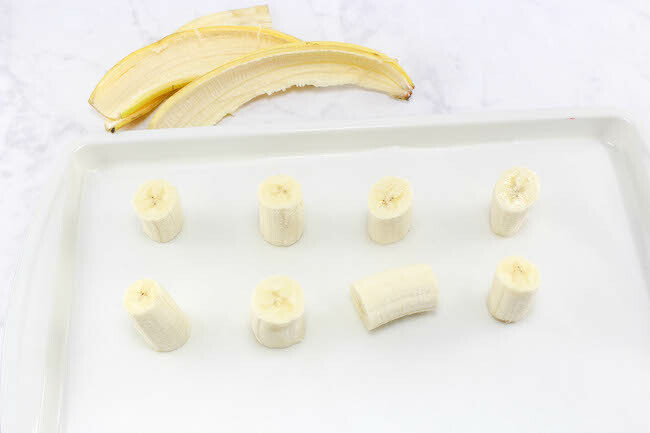 Peel bananas and cut into 2-3 inch pieces. 2. 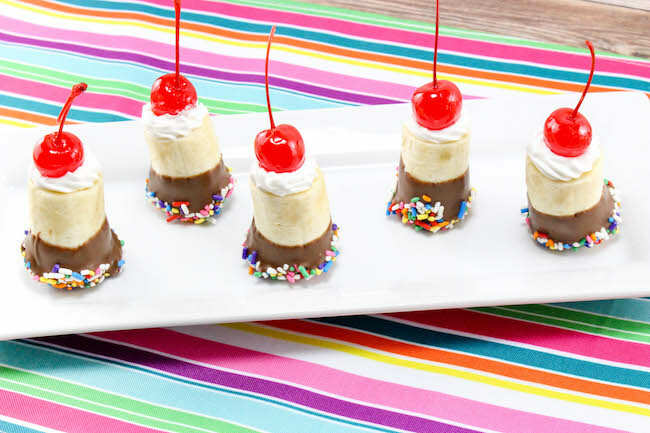 Melt the candy discs per package directions and dip each banana into melted chocolate about halfway up. 3. 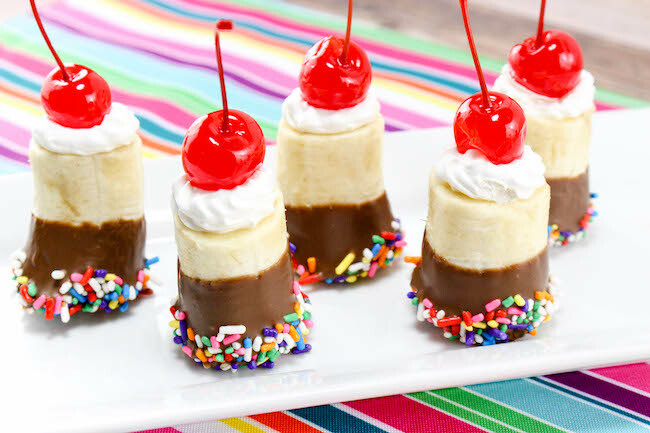 Dip the chocolate end of the bananas into the sprinkles, nuts, coconut or whatever you choose and coat well. 4. Let these set up and harden for about 10 minutes. 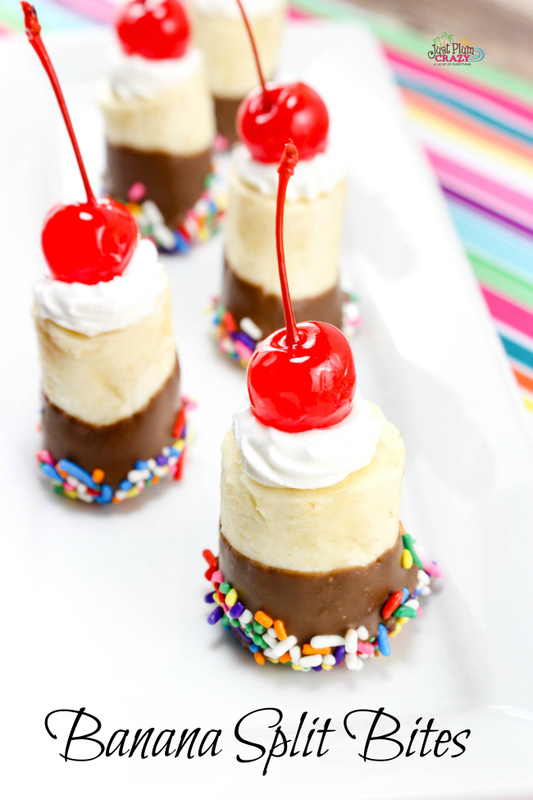 *Baker’s tip – Bananas have a tendency to turn brown pretty quickly especially if you make them ahead of time. Make them last longer by dipping in lemon juice or what I prefer is placing them in 7-up or Sprite which has the same effect. 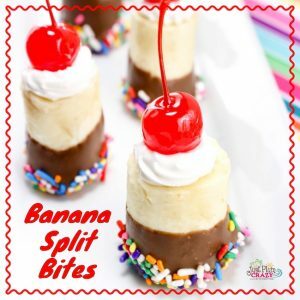 Peel bananas and cut into 2-3 inch pieces. 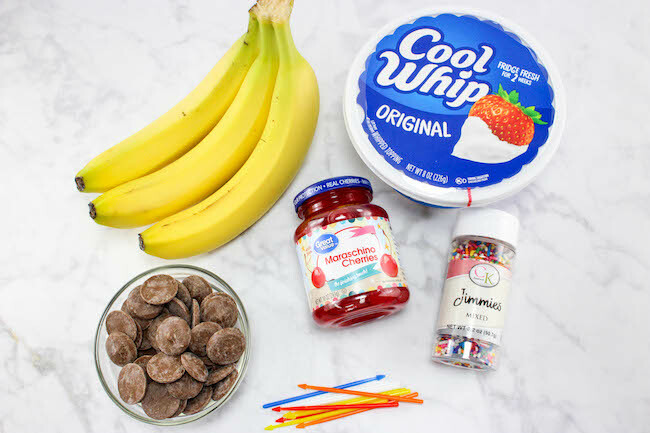 Melt the candy discs per package directions and dip each banana into melted chocolate about halfway up. 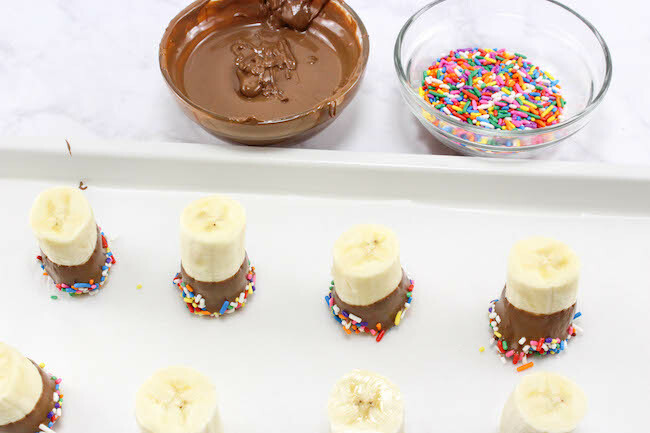 Dip the chocolate end of the bananas into the sprinkles, nuts, coconut or whatever you choose and coat well. 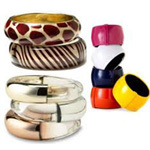 Let these set up and harden for about 10 minutes. 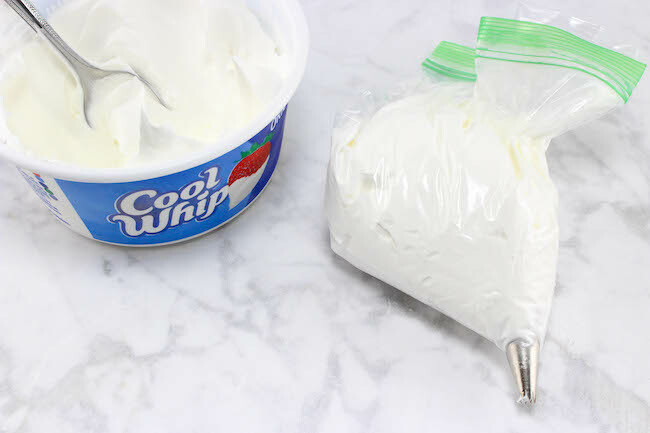 Place the whipped topping into a piping bag or plastic bag, and pipe a small dollop onto the top of each banana. 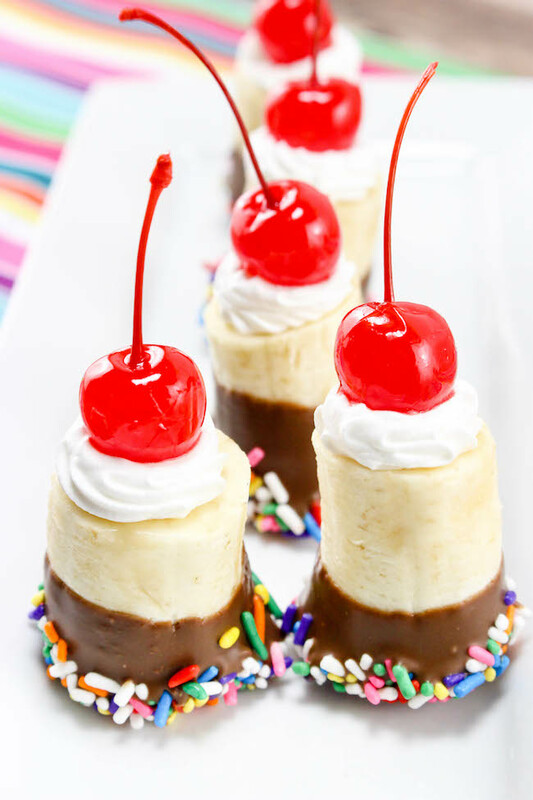 Place a cherry on top of each banana. 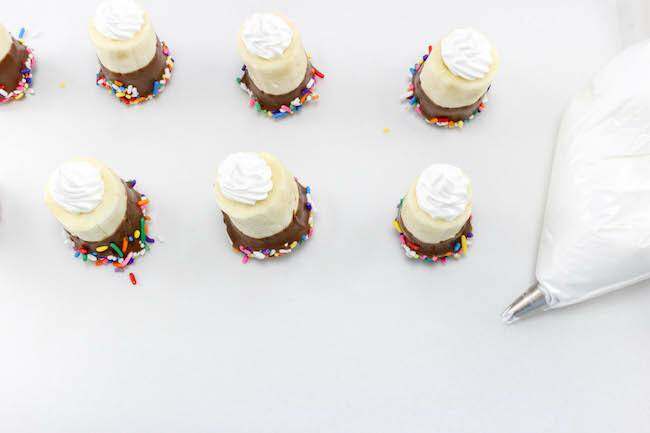 *Baker's tip - Bananas have a tendency to turn brown pretty quickly especially if you make them ahead of time. Make them last longer by dipping in lemon juice or what I prefer is placing them in 7-up or Sprite which has the same effect.